January, we meet again. January is a time for New Year’s resolutions and new beginnings, but for us, January is a reminder of seven years ago when it didn’t hold anything new. Instead, January left us with an end, the end of Gracie’s life. On January 17th, it will be seven years since Gracie died, and it hasn’t gotten any easier. I miss her. I long to hold her, to see her grow up, to fight with her siblings, to argue with me about stupid stuff, to see her play with her friends, to hug and kiss her just one more time. That can never happen, and it literally takes my breath away every single time I think about it. With tears in my eyes, I replay the events and emotions of this month, seven years ago. I recall the days before she left us and the moment she left us over and over in my head, hoping it’s a bad dream while knowing it’s not. When a person’s time has ended with a loved one, holding onto the memories made, in order to keep them alive in your mind and heart, seems like all that one can do. I’ve talked a lot about all the memory-making vacations we’ve taken, but I had forgotten about the everyday memories and everyday life with Gracie….until I recently went on a cleaning spree. I believe that my girl knows I struggle with his month and sent me a sign to give me some comfort. While cleaning the closet and taking the many piles of “stuff” off the top shelf of our closet, I found our “take this when Gracie goes somewhere” bag. Our girl was too special for an ordinary bag, so she was given a “Vera Bradley” bag! When I grabbed this bag from the top shelf of the closet, my eyes started watering and then I started laughing. This bag went everywhere with us (take everywhere with a grain of salt). When your child has cancer, you can’t really go everywhere. Your outings consist of clinic visits, hospital stays and RMH stays. But at least we were going out, and if we were going out, it was going to be in style! I laughed when I thought about this because we were known as the “Vera Bradley” girls. We’d come into the hospital or clinic with this bag, and I always had my Vera Bradley purse. 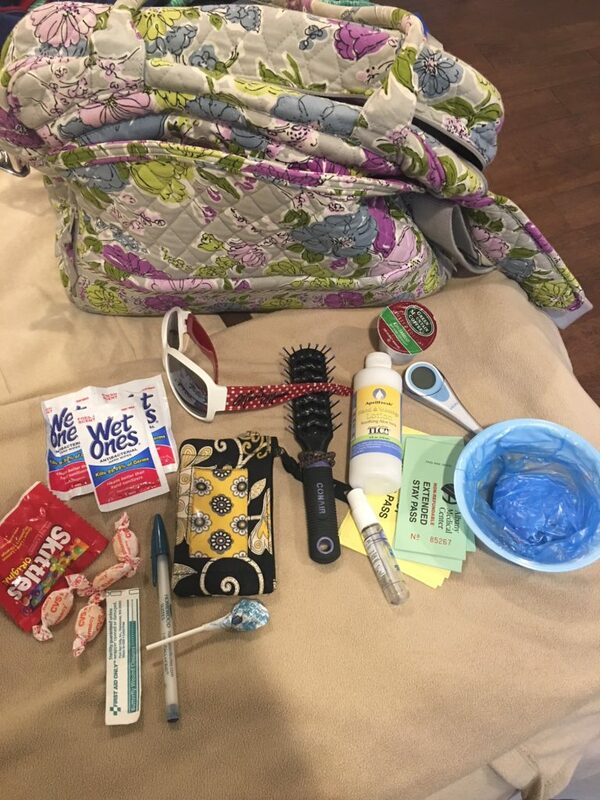 My mother-in-law often went with us and she had a Vera Bradley purse, and we always traveled with an overnight bag…. you guessed it, a Vera Bradley overnight bag! So here we were walking into clinics/hospitals looking like an advertisement for Vera Bradley or like we were a stand in NYC selling knock off Vera Bradley bags every time we went out. Staff in the clinics/hospitals almost always noticed and made some type of joke to make us smile and laugh. I miss seeing them. I miss having those people in our life, as they were our “home away from home” family. They were a part of our everyday, normal, routine memories with our Gracie. When I opened this bag, the everyday memories with my girl came flooding back in. Among the variety of items in the bag were a small package of Skittles and a lollipop. These were for Gracie when her appetite and taste buds were gone; a little piece of candy would often make her feel a little better and erase from her mouth that metallic taste that chemo left her with. The bag also contained Wet Ones for those sticky one-year-old hands and to sanitize our own hands after going anywhere. There was a pen to sign the papers saying I was made aware of what the chemo drugs might do to my child and that I still give consent for her to have them. I also used this pen to write in my journal and to let Gracie scribble on paper. There were cough drops so Geoff and I wouldn’t cough at night in the hospital and wake up Gracie (or other patients). My wristlet (Vera Bradley again! ), to keep my money in to buy food at the hospital cafeteria, was also in the bag. Our Mickey sunglasses were in there, too. We got them on our trip to Disney World, and I would wear them while driving to Albany, and Gracie used to hold them when we got there. There was a brush that was used in the beginning for Gracie’s hair, and when she lost all her hair, I used it to put my hair in the most common hairstyle you’ll see at the hospital, a pony tail. The bag also held hospital lotion to put on Gracie’s thin and fragile legs, arms, and face after a sponge bath and a spray hand sanitizer to keep germs away at all times. There were also Albany Med. parking passes to use during the twice-a-week and eventually daily visits to the hospital. In the bag, I also found a vomit bag in case Gracie got sick in the car from her treatments and a thermometer to check her temperature a million times a day for a fever. A fever was dangerous and meant a hospital stay. And last but not least, there was one K cup in the bag. Gracie held onto K cups in her little hand almost the entire time she battled cancer. She didn’t do anything with it; she would just hold one in her hand as if she were keeping it safe or maybe it was helping her feel safe. In her other hand would always be her bunny. I did not find the bunny because it is with her. As sad as it is to think about these items as a large part of her everyday routine, they have meaning and are special to us. They are the little things in life that now make me happy to see and think about because they remind me of our life and our time with Gracie. I didn’t forget them. They were just in the back of my memory probably marked as “everyday, boring, mundane stuff.” But those everyday memories are much more valuable than we think. They were moments, moments spent with Gracie. I have not bought a new Vera Bradley purse or bag since retiring all of them in January 2012, but I will always have that special bag and the special meaning that it contains. That bag and all its items are right back up on the top shelf of my closet and while I don’t physically carry it with me anymore, I will forever carry with me the priceless memories that it holds. I miss you, Gracie. I love you, Gracie. Happy 7th Angelversary in heaven my Gracie girl. I just read your e-mail with tears in my eyes. Unfortunately I know the pain of losing a child never goes away but the memories sure help and are comforting as the years go by. In lieu of Christmas gifts in November, my sister-in-law asked if we had a place she could make a donation as our gift from her. We immediately thought of Amazing Gracie’s Gift Foundation and she sent a check to you. I know that money can be used to make a difference in someone’s life. Blessings to you as the 7th anniversary of Gracie being in Heaven arrives. Keep in mind that with each passing day, you are one day closer to seeing your Gracie again. That is my saving grace. Blessings to you today and always.